On February 16, 1948, Harold and Robert Pfeninger bought out a local trucking business. The brothers hauled livestock to South St. Paul and occasionally to Sioux City, Iowa. They also took grain to the Twin Cities and surrounding areas to be sold. On their return trips they would bring back freight to the Villard, Glenwood, and Alexandria areas. In October of 1979, Robert’s son, Tom, bought out Harold’s share of the business. Then in January of 1988, another son, Jim, bought out Robert’s share and the business became Pfeninger Trucking, Incorporated. The fleet has since grown to 19 Pfeninger trucks with two owner/operators. There are approximately 40 employees, both full and part-time. The company, still located out of Villard, MN, runs almost two million miles per year across the United States. In July of 2008, Pfeninger Warehousing, LLC opened for business. It is located on Highway 29, one mile South of I-94 by Alexandria, MN. The 50,000 square foot warehouse serves as the company’s central warehousing and distribution center, storing an assortment of products including food grade. By January of 2011, the Pfeninger Warehouse expanded, adding another 50,000 square feet. The addition in 2014 doubled the existing facility by adding another 100,000 square feet, creating a total space of 200,000 square feet. The warehouse provides both floor space and pallet racking with 20 dock doors of different sizes for loading and unloading. 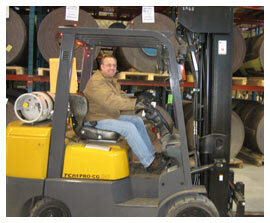 Employed at Pfeninger Warehousing are five full and part-time employees. The warehouse is able to provide different storage solutions for a variety of storage needs.